​Each year in September we pause to honor our nation’s senior centers. 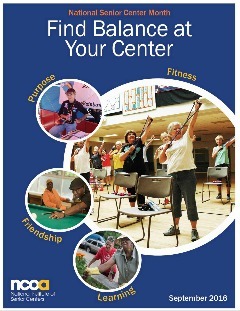 The 2016 National Senior Center Month theme, Find Balance at Your Center!, highlights how senior centers are providing programs that focus on the whole person allowing seniors to live healthier lives and stay involved in their communities. I have had the pleasure of visiting senior centers around the country and I have seen firsthand how these community hubs are linking older adults with critical programs and services.